One of the best Ramen Soups I have ever had, was in the Samurai Ramen in Hong Kong. It’s a lovely mini bar that fits only 9 guests, but hours of queuing are definitely worth it. In Munich the best one so far, I have found in the Takumi restaurant. I love how they prepare slow poached eggs over there. 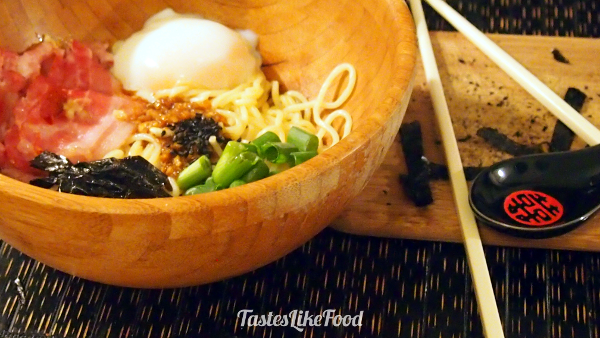 Now I always make them at home for our Ramen Soup. In a large pot place the chicken stock and add 2 shredded garlic cloves, 4 Tbs soy sauce, ginger and Five Spice. Bring to boil. In the meantime heat up the olive oil in a small saucepan over medium-low heat. Add the chili flakes and the remaining 4 garlic cloves and fry, stirring, for about 1-2 minutes. In a small bowl prepare the soy sauce mixture. Mix 2 Tbs of soy sauce, fried garlic and chili flakes, mirin, rice vinegar, sesame oil and brown sugar. Set aside. Cook the ramen noodles according to the instruction on the package and drain well. Fry the bacon over high heat for around half a minute on each side. Remove it immediately when the sides start getting crunchy. Do not over-dry it. To make slow poached eggs, place them in a pot filled with the warmest tap water possible. Put the pot on the stove over lowest heat and keep the eggs heating that way for around 45 minutes. Do NOT bring the water to boil. 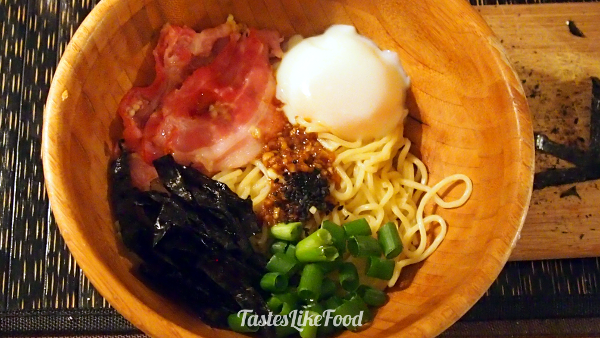 Place the noodles, bacon and the poached egg in a bowl. 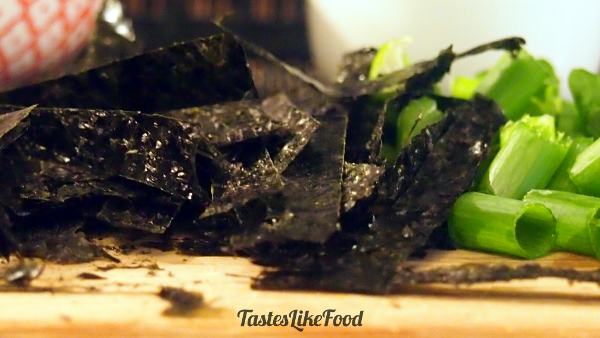 Add stripes of seaweed and shredded green onions. Flavor with the soy sauce mixture and fill with the stock. Enjoy!